For the nation's best prep athletes, the year 2016 presents several major championship events that culminate this summer with the U.S. Olympic Trials in Eugene, Oregon, and the IAAF World Junior Championships in Bydgoszcz, Poland. 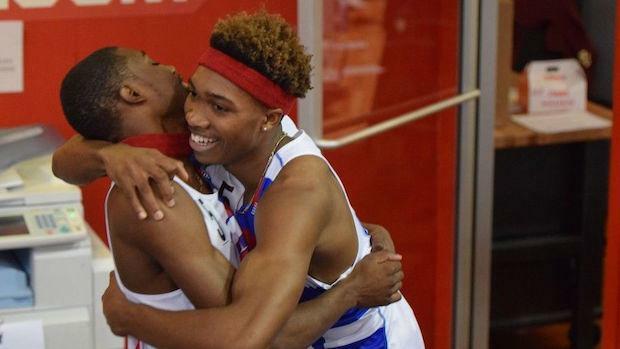 Sprint-superstar brothers Noah and Josephus Lyles of T.C. Williams, Virginia, confirmed with the IAAF today that they plan to contest both events. "We both want to run at the USA Trials," Noah said. "I'm qualified in both sprints, but Josephus is just a little short in the 400m. But even if we both don't make the Trials, we want to run the National Juniors and then go to the World Juniors." "Hey, we want to go to the Trials and make the U.S. team," Josephus said. "But the World Juniors are important, too. It will be my second time there and Noah's first." Josephus was the youngest member of the Team USA contingent to qualify for the 2014 World Junior Championships. He turned 16 the day before competition opened, and ran on the gold medal-winning 4x400-meter relay. Noah did not compete at World Juniors that year, but both brothers could lead Team USA this summer in Poland. Noah ranks No. 1 in the nation this year in the 100m (10.17) and 200m (20.48), while Josephus' season-best 400m of 45.94 ranks No. 2 in the U.S.
To get to Poland, the brothers must place within the top two at the USATF Jr. National Championships, held June 24 to 26 in Clovis, California. They'll have a quick turnaround before the U.S. Olympic Trials, slated from July 1 to July 10 at the University of Oregon. The World Junior Championships will run from July 19 to July 24. After that? They'll take their talents to the University of Florida, along with fellow Virginian and "third Lyles brother," triple-threat athlete Grant Holloway. More information on how to qualify for the USATF Jr. National Championships here. More information on how to qualify for the IAAF World Youth Championships here. Athletes aged 16, 17, 18 and 19 years old are eligible to compete. More information on how to qualify for the U.S. Olympic Trials here.